In this tutorial we will show you how to setup header layouts or style and logo settings in your website. Navigate to Appearance > Theme Settings > Header from admin panel’s sidebar. Below are general settings of header section, you can override header setting at page, post or portfolio post level also. Header section configuration settings include header on/off option. You can disable header if you don’t wish to show header. 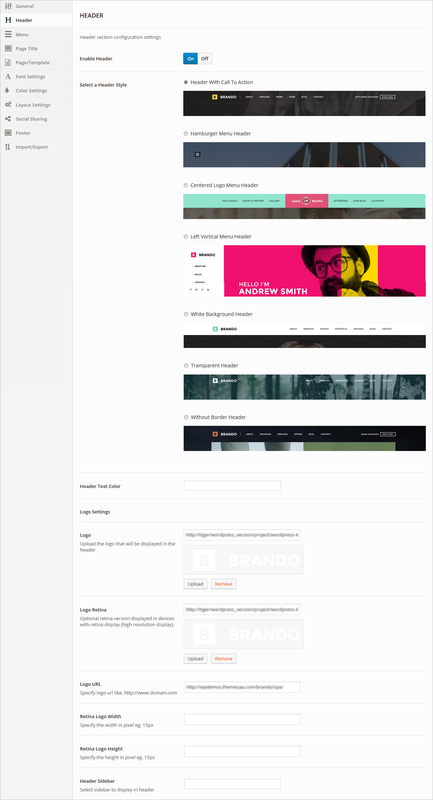 Brando theme includes 7 different and creative header styles. Header With Call To Action, Hamburger Menu Header, Centered Logo Menu Header, Left Vertical Menu Header, White Background Header, Transparent Header, Without Border Header. You can select any style as per your need. You can also set header text color as white or black. You can set logo, retina logo, logo url, retina logo size and also set header sidebar for call to action button, content block or social media icons. Now click on menu tab, from here you can assign menu for header section.